The truth is I didn’t want to take a lesson this Saturday. Regardless of the fact that it was an opportunity to work with one of the top Event riders in the country, Corinne Ashton, I had many reservations. The money was a factor; it was $50 from my Christmas budget. The time was inconvenient and this was the last day off until December 24th. The other niggling problem was I couldn’t convince myself it was important. Based on the last two experiences Night and I had “outside of our comfort zone” I was expecting a struggle and frustration at riding for an instructor. The post I wrote about our outing with the Dover Saddlery crowd may not have told the whole truth. It was fun but the tension between Night and I was strong and we fought the entire time. She wouldn’t listen and I wrangled her physically (i.e. shouted) instead of thinking through the problem. Needless to say, we were both very tired and sore in the end. The next week I took a tumble, it was definitely due to operator error. Now I was beginning to doubt my ability and our connection. So perhaps I showed up with a bit of an attitude. Night was quiet and peaceful though we were riding in the indoor arena, not out on our beloved trails. I won a lesson with Corinne several years ago in a fund-raiser for GMHA. We reintroduced ourselves and she had me warm up Night at one end of the arena while she got on Julia’s young, gray Thoroughbred. We were told to work on stopping, walking and trotting without reins. Slowly I felt magic happening. We were in sync, gliding from gait to gait, I repeatedly looked toward the other end of the ring to see if Corinne was noticing our union. My mind was screaming, “Hey look! Isn’t this great?? We’ve got this! !” She seemed preoccupied with Julia’s horse, that drove me to keep the connection going. When our turn came, she mounted Night and said, “Oh you two get it!” All my worry and hesitation drained away and I smiled at my little brown horse. The rest of the lesson was working over ground poles at a lovely slow canter, expanding and contracting our strides between them from four strides to three. Simple but tricky and demanding of our partnership as we both felt we knew the best way to accomplish the task. There was no fight, no outright disagreement, just a compromise of “Well if you do this and I respond like that, we won’t get the stride. Hmm, let’s think this through again.” And the next time it was fluid. This entry was posted in memoir. 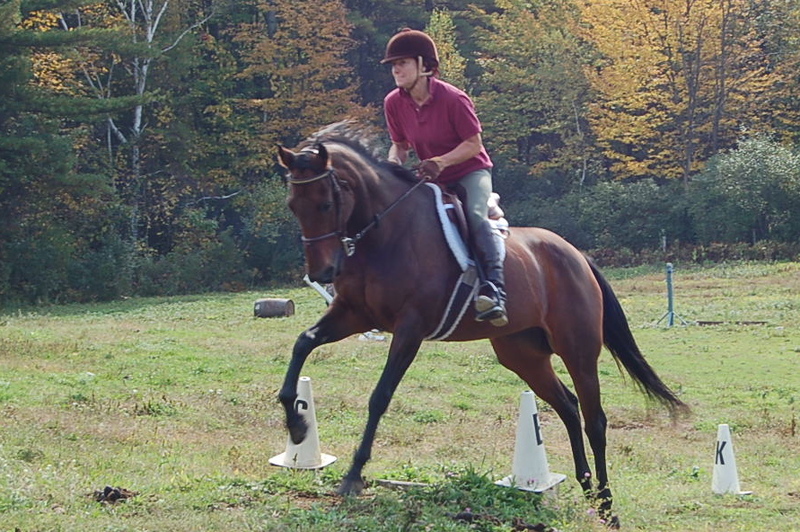 Tagged attitude, Corinne Ashton, eventing, life after 55, life lessons, memoir, New Hampshire, riding, riding lessons. Thanks Laura. I need to get you out riding again soon!! The connection between us and an animal can be a magical thing. I use to have a dog that I swore could read my mind. I wouldn’t be surprised if your dog could read your mind. I think there are very strong connections with those who share our daily life. I’ve never ridden a horse but reading your post I think I have an inkling why people love it so much. Marie, wouldn’t it be wonderful to have you visit to ride the trails with me? Maybe we could even spot a Cardinal! !